Brexit architect Nigel Farage has slammed George Soros over his alleged backing of the European project. Farage, speaking at the European Parliament, said the billionaire’s influence in Brussels and Strasbourg was ‘really extraordinary’. Philanthropist Soros, originally from Budapest, recently gave $18 billion (15.2 billion euros) to the foundation Open Society, which he set up in 1979 to back human rights causes, promote liberal values and build “vibrant and tolerant societies”. Farage, speaking during a debate about the Paradise Papers scandal, a huge leak of financial documents that shed light on the world of offshore finance, said: “When we are talking about offshore money, when we are talking about political subversion, when we are talking about collusion, I wonder if we are looking in the wrong place? “And I say that because George Soros recently gave Open Society, which of course campaigns for freedom of movement of people and supranational structures like the European Union, $18 billion. “And his influence here and in Brussels is truly extraordinary. 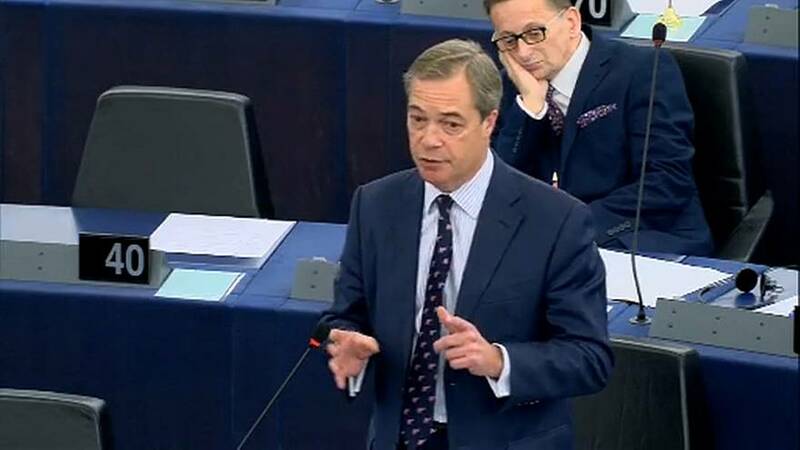 Farage – whose opening words were met with cries of ‘so what? !’ – claimed Open Society boasts of more than 40 meetings with the European Commission last year and have published a book of reliable friends within the European Parliament. He has called for an investigation and said he will write to his fellow MEPs and ask if they have received funding from Soros. Open Society said in a statement to Euronews: “Pluralistic democracy requires debate and dialogue among a wide range of stakeholders including elected representatives, public officials, and civil society actors. Far from being a nefarious activity, as Mr Farage seems to think, such conversations are an important part of democratic policy debates. George Soros has never funded individual MEPs. Soros remains a controversial figure in Hungary, especially for the supporters of Prime Minister Viktor Orban. Orban, recently chosen to lead the Fidesz party into elections next year, has accused Soros of whipping up hostility towards him.